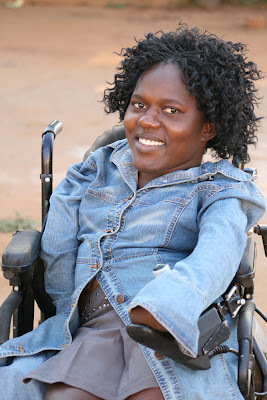 "I want to show the world that disability does not mean inability." Prudence Mabhena weighs just 50 pounds, the result of arthrogryposis multiplex congenita (AMC) , a rare disorder that affects 1 in 300 births. It causes tight muscles and joints, muscle weakness and limited range of motion. In Mabhena's case, the diagnosis has also taken her legs. She has never walked and uses a 600-pound wheelchair to more freely realize her life dreams. She is physically small, but her voice is powerful in more ways than just the obvious. Mabhena is the lead singer of the Afro Infusion band Liyana and the subject of the award-winning feature by filmmaker Roger Ross Williams on HBO2 entitled Music by Prudence. The film follows Mabhena's difficult life path and the remarkable transcendence of the Zimbabwe native "from a world of hatred and superstition to one of music, love and possibility." It's a gritty tale, making the talented 23-year-old's accomplishments the more remarkable. This film provides one of those popular examples of the power of the human spirit to overcome great adversity. 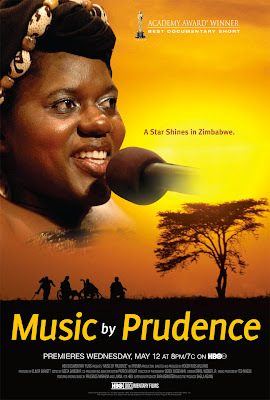 Music by Prudence helps fuel needed hope, inspiration and motivation to others with disabilities as it educates the masses, including in places where disability is still viewed as a curse, witchcraft, or the result of poor life choices. When it comes to worldwide disability awareness and understanding, we still have far to go. By showcasing her abilities in this film, Prudence Mabhena, has become an amazing advocate and teacher for millions who struggle with the daily realities of special needs, and for the families who raise them. By bringing this remarkable story to the world's attention, Williams has delivered a beautiful and powerful message worthy of our time.